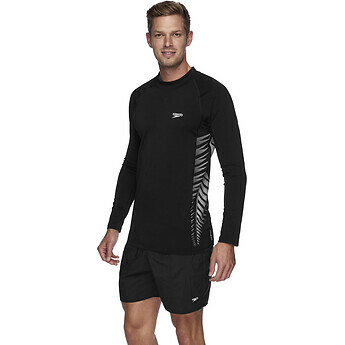 This sun top has long sleeves and a longer body length for additional coverage and comfort. Made from Endurance, an exclusive Speedo fabric designed to last longer. It is 100% chlorine-resistant which resists snagging and fading 20 times longer than any other swim fabric. This fabric also features 4 way stretch technology for added softness and comfort. Skin specialist advised me to use a rashie to protect skin. Chlorine tough for pool use will outlast surf brand rashie.